An article published in the journal “The Astrophysical Journal” describes a research on the brown dwarfs in the Epsilon Indi system in connection with the mass limits for this type of objects. A team of researchers combined the data obtained from various observations to re-estimate the two brown dwarfs masses, which were found to be 75.0 ± 0.82 and 70.1 ± 0.68 times the mass of the planet Jupiter. These are much higher masses than previous estimates and at least the largest one has a mass that according to the theoretical models is that of a star offering new information to understand where are the limits between these objects. The Epsilon Indi system includes a star with mass and volume about three quarters of the Sun and being about 12 light years away from Earth and therefore in the neighborhood in astronomical terms has been studied for centuries. 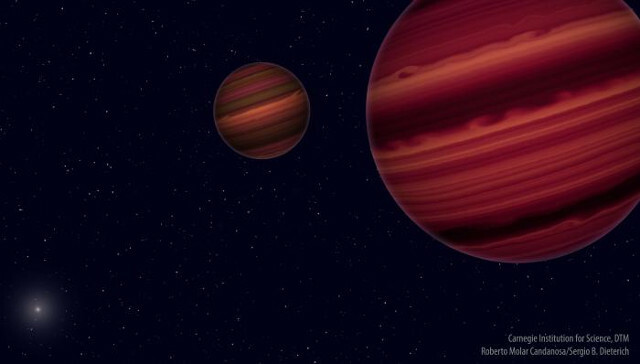 In 2003 a brown dwarf was discovered whose distance from the star is about 1,500 times that of the Earth from the Sun and the subsequent observations made it clear that actually it’s a binary brown dwarf with two objects that orbit each other at an average distance slightly more than twice that of the Earth from the Sun. The image (courtesy Roberto Molar Candanosa and Sergio Dieterich, Carnegie Institution for Science. All rights reserved) shows an artistic concept of the Epsilon Indi system. In the foreground there are the two brown dwarfs orbiting each other other while they orbit the star Epsilon Indi A, visible far away in the lower left corner. The Epsilon Indi system’s case is really interesting and for this reason it was the subject of several studies that include two long-term ones, the Carnegie Astrometric Planet Search at the Carnegie Las Campanas Observatory and the Cerro Tololo Inter-American Observatory Parallax Investigation run by the Research Consortium of Nearby Stars, which provided detailed information on the motion of the two brown dwarfs, which were initially named Epsilon Indi Ba and Epsilon Indi Bb but were later named Epsilon Indi B and Epsilon Indi C.
The combined analysis of that data in the course of this new research allowed to obtain new estimates of the mass of Epsilon Indi B and Epsilon Indi C. According to a study published in January 2004 in the journal “Astronomy and Astrophysics”, their masses are 47 ± 10 and 28 ± 7 that of Jupiter therefore the new estimates of 75.0 ± 0.82 and 70.1 ± 0.68 Jupiter’s mass are much higher even taking into account the first estimates’ wide margin of error, a surprise even for the researchers. A considerable amount of data collected over a long time can sometimes correct calculation errors caused by the use of limited amounts of data. In the Epsilon Indi system’s case, however, the surprise comes not only from the fact that the two brown dwarfs seem really massive but also because they’re very close if not beyond the minimum mass limit for a star, estimated between 70 and 70 times Jupiter’s mass, around 7% of the mass of the Sun. Serge Dieterich of the Carnegie Institution, first author of the research, commented on the fact that his team showed that the heaviest brown dwarfs and the lightest stars may have only a slight difference in mass and yet their lives are different given that brown dwarfs are very dim and cool while stars shine for billions of years. He added that understanding the boundary between brown dwarfs from stars will improve our understanding of their formation and evolution, as well as the possibility that they have habitable planets. An article published in July 2017 in the journal “Astronomy & Astrophysics” described the discovery of the star EBLM J0555-57Ab, the smallest ever discovered, with a size very similar to the planet Saturn’s and a mass about 85 times Jupiter’s. This star has barely enough mass and density to keep the nuclear fusion of hydrogen and thus be a true star. This means that it can be useful to define the limits between stars and brown dwarfs. Dr Alycia Weinberger, also of the Carnegie Institution and among the authors of this new research, pointed out that an improved definition of the dividing line between stars and brown dwarfs can also help astronomers to determine how many of them there are in the Milky Way. She also mentioned astronomers’ interest in understanding if stars and brown dwarfs exist in the same proportions in star-forming regions, a fact that could help to understand the habitability of the galaxy. Brown dwarfs have been known for just over twenty years, although their existence was theorized much earlier. Their emissions are particularly dim, so even the ones in the neighborhood such as Epsilon Indi B and Epsilon Indi C require considerable efforts to study them properly. This system is an excellent space laboratory to test brown dwarf models and their formation so they’ll keep on studying them, also with the instruments that will come into operation in the coming years.